About TOP 10 INVESTOR MONTHLY BONUS. We glad to introduce to you a new bonus program "Top 10 investors of month". you can check box "TOP INVESTORS" on the Right side of every page. We will be provided bonus every month. Q: How to get bonus? A: Be a members of List4HYIP.com and signed in when you requested RCB for any program, of course you must be registered under our Ref link in programs which you joined. Of course you must be top 10 investors for the monthly bonus. Q: How it is work? A: We wll provided you $1 - $50/monthly. 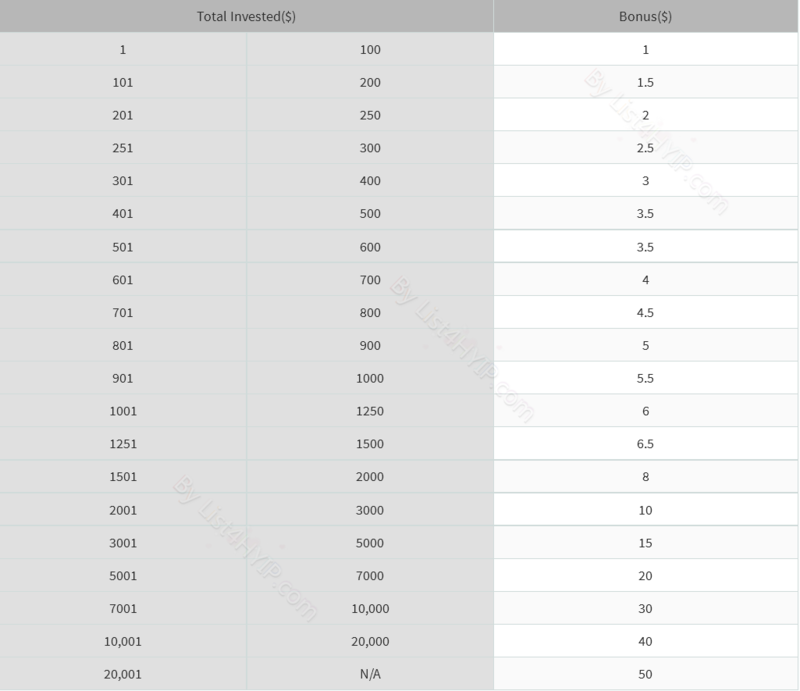 The amount will be depended on your total investment, you can check the following table. Q: When will i get the bonus payment? A: We will pay Mid of every months. Note: Total Invest($) will be calculated every month!